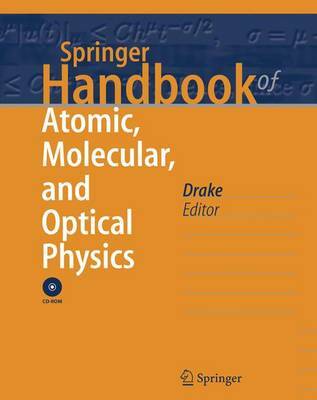 Comprises a comprehensive reference source that unifies the entire fields of atomic molecular and optical (AMO) physics, assembling the principal ideas, techniques and results of the field. 92 chapters written by about 120 authors present the principal ideas, techniques and results of the field, together with a guide to the primary research literature (carefully edited to ensure a uniform coverage and style, with extensive cross-references). Along with a summary of key ideas, techniques, and results, many chapters offer diagrams of apparatus, graphs, and tables of data. From atomic spectroscopy to applications in comets, one finds contributions from over 100 authors, all leaders in their respective disciplines. Substantially updated and expanded since the original 1996 edition, it now contains several entirely new chapters covering current areas of great research interest that barely existed in 1996, such as Bose-Einstein condensation, quantum information, and cosmological variations of the fundamental constants. A fully-searchable CD- ROM version of the contents accompanies the handbook.